His nickname was the Ariete because, yes, he was a guard but his weight clocked often over 100 kg and he drove head-first, fearless. But Roberto Premier, born in Spresiano in the January of 1958, was a terrific shooter and came to Milano, in the summer of 1981 for his characteristics of perimeter player with range and heart. Coach Dan Peterson experienced some early difficulties in forcing him to adjust his play to the defensive responsibilities necessary in a top team after Premier was a terrific scorer in Gorizia, the classic run and un team. Eventually Premier adjusted, forced to do so by the Peterson rule: “You stay on the court until your guy score then you come out, regardless of what you are doing offensively”. He gradually became a team cornerstone, the chosen shooter, the fighter. He won five championships, two European titles and a Korac Cup too. He went on to play for the National team in an era particularly rich in the position (think about Antonello Riva, who eventually took his place in Milano, or Enrico Gilardi in Roma) and took part in the number1984 Olympics. 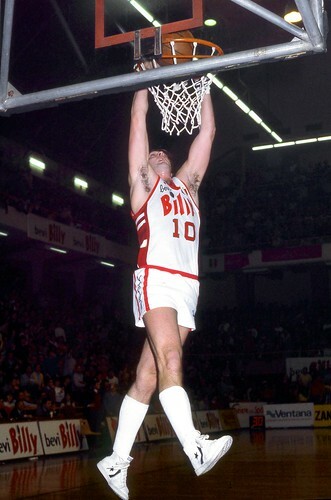 He’s the all-time second best scorer in Olimpia with 4813 points, behind D’Antoni, but he’s also the leader for free throws made with 908. His last game for Olimpia was in Livorno. It finished with the win, the championship and a brawl with the local fans. And Premier in the middle of them all.